This tool reads the longitude, latitude, and altitude coordinates from JPEG and TIFF photo files and writes these coordinates and associated attributes to an output point feature class. Direction—The direction the device is pointing when the photo was captured. Values range from 0 to 359.99, where 0 indicates north, 90 east, and so on. If no direction is recorded by the device, this field will have a value of -9999. Depending on the device being used this could refer to degrees from true north or magnetic north. Refer to device documentation for more information. Use a geotagged photo's directional information with caution, as the direction recorded by the device may not be accurate. Refer to device documentation for information on directional accuracy. The output DateTime field is a text field with the timestamp in the format yyyy:MM:dd HH:mm:ss. Use the Convert Time Field tool to convert this text field to a true datetime field that can be used to analyze and map the data with time. If the output DateTime field has a null or empty value, this may be an indication that your device does not capture a useable timestamp with the geotagged photo. Photo files may have a date taken or date modified property, but these often do not represent the date and time the photo was taken. If the x,y coordinates of a photo are 0,0, no point will be generated for that photo. These empty coordinates often occur because the camera GPS does not have an adequate signal to capture real coordinates. 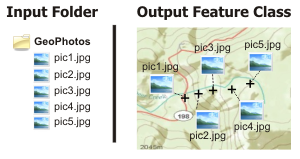 If the Include Non-GeoTagged Photos parameter is checked (ALL_PHOTOS in Python), the photo will be added as an output record with a null geometry. The output feature class will have a GCS_WGS_1984 spatial reference, since that is the coordinate system used by GPS receivers. The optional output table that will list any photo files in the input folder with invalid Exif metadata or empty GPS coordinates. Specifies if all photo files should be added as records to the output feature class or only those with valid GPS coordinates. ALL_PHOTOS — All photo files will be added as records to the output feature class. If a photo file does not have GPS coordinate information, it will be added as a record with null geometry. This is the default. ONLY_GEOTAGGED — Only photo files with valid GPS coordinate information will have records in the output feature class. Specifies if photo files will be added to the output feature class as geodatabase attachments. ADD_ATTACHMENTS — Photo files will be added to the output feature class records as geodatabase attachments. Geodatabase attachments are copied internally to the geodatabase. This is the default. NO_ATTACHMENTS — Photo files will not be added to the output feature class records as geodatabase attachments. The following Python window snippet demonstrates how to use the GeoTaggedPhotosToPoints tool. The following script demonstrates how to use the GeoTaggedPhotosToPoints tool.